An opulent 5 tier centrepiece wedding cake, created to impress. 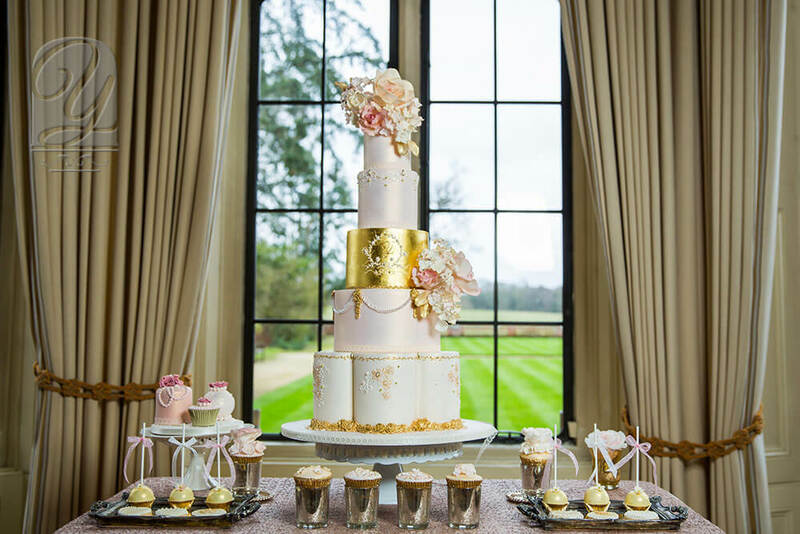 The couple’s initials are delicately-piped inside an imperial crest on 24 carat gold leaf, combining elegantly with fabulous hand-crafted sugar-flower accents and glorious pearl and lace patterns which perfectly compliment the Bride’s dress. Dressed with a luxury Dessert Table from Unique Cakes by Yevnig, The Evelina is provides the ultimate focal point for the discerning wedding.